Welcome to the Steel Framing Alliance’s Media Room, your one-stop shop for the latest news and information on a broad range of Cold-formed Steel (CFS) topics in the commercial and residential construction markets. We invite you to check out our press releases, fact sheets and case studies. If you need more information or would like to arrange an interview with an SFA spokesperson, please contact us. It seems as if the construction market is finally turning the corner and beginning to move forward once again. Projects across the country are coming off the drawing boards, being financed and going into production. Like all construction materials, cold-formed steel has had its challenges during the economic downturn. However, all across the United States, projects incorporating cold-formed steel are beginning to take shape from the ground up. Cold-Formed steel framing (CFSF) began as a kind of alternative lumber, but after decades of positive performance it has finally come into its own. From the beginning, steel framers cut and combined steel studs and track to build up other, more complex shapes, much as wood carpenters do, without any real standardization of assemblies or connections. Every special structural element, such as rough opening, had to be detailed separately by the engineer of record. Contractors didn’t always follow those project specific details and may have done it another way. In any case, there has been considerable variation in the quality of field assemblies. 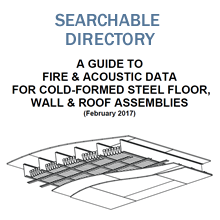 By Mark Nowak and W. Lee Shoemaker, P.E., Ph.D.
Cold-formed steel (CFS) is widely used in conventional construction as well as in metal building systems. It continues to show promise, even with the overall size of the construction market shrinking during the latest economic turndown. More than ever, building owners and contractors are seeking buildings and materials that are cost-effective but also meet specific code requirements for non-combustible construction. Throw in the increasing demand for sustainable or "green" products, and CFS starts to make a lot of sense. How Effective Are LCA Studies in Building Evaluation? A Life Cycle Assessment (LCA) study can be a useful way to identify improvements to a product or process. Essentially the goal of LCA is to compare the full range of effects to provide a sound basis for reducing a product or process’s impact on the environment. But how effective are LCA studies when applied to building codes? The focus on sustainable building design is creating a fundamental shift in the way that new projects are approached by architects, designers and engineers. As they search for material solutions that provide energy and cost efficiencies, steel is available to help them meet the highest sustainability standards. Pittsburgh—Piatt Place, a mixed-use destination with 60 upscale residential condominiums in downtown Pittsburgh, is green to the bone. Completed by Millcraft Industries in 2009, the property is a shining example of how a non-green building can be reincarnated with a sustainable structural material—cold-formed steel—to become a model of green development, and how it can help revitalize a city. Metal Architecture asked several industry experts about the codes, regulations and standards facing metal architecture industry today. MA: The International Code Council has developed a new green code titled the Green Construction Code to promote energy-efficient buildings constructed with enforceable, safe and sustainable building codes that complement LEED and oher rating systems. How will this impact the metal architecture installation, costs, documentationa and design? The state of the global economy has changed the construction market for at least the next several years. In a down economy, developers are implementing strategies to maximize their return on investment and this has resulted in evaluating construction techniques and technologies being used. By Mark Nowak and Jay Crandell, P.E. However, the rapid acceleration of stricter energy code requirements in the past year has brought about a new urgency for engineers to become more than just designers of the building’s load bearing frame. As the construction industry recovers from the Great Recession, and more builders resume operations, many will discover a changed world. That’s because while time may have slowed for builders in recent years, governmental, regulatory and professional entities have been busily honing and adopting a new range of green building codes and standards that are changing their industry. If the multi-housing and commercial building industries have heard a lot more about new energy-efficiency codes recently, it’s because the time has come to pay the piper. And the piper is the American Recovery and Reinvestment Act of 2009 (ARRA). States that accepted ARRA stimulus funds did so with strings attached—including the requirement that they adopt the 2009 International Energy Conservation Code (IECC) and subsequent editions.